So, I started a new game as the Bulrathi – not a race I'd normally pick because I think ground combat bonuses are rather pointless in Master of Orion II although they do get an offensive bonus in ship combat which is neat and they hail from a High-G homeworld which means they can settle normal-G and high-G worlds without penalty! The first race I met were the Mrrshan who were ages ahead in tech – and I had no idea how; what was even more mystifying though was when they surrendered their empire to me for no apparent reason! The Silicoids surrendered to the Elerians shortly after and eventually the Darloks got wiped out by the Antarans, leaving only my empire and the Elerian empire in the game. Speaking of Antarans, man are they annoying: they've now destroyed my colonies five times now. 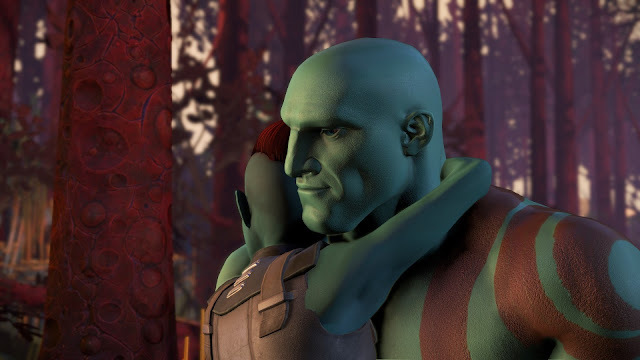 I finished episode 4 of Guardians of the Galaxy this week (before we lost NBN on Thursday night) and was shocked when one of the Guardians actually died. You actually get to choose whether Drax lives or dies in this episode and while I didn't really want him to die I naively thought he would survive taking on a giant beast all on his own. I guess this is what happens when you have Telltale make an adventure game: it becomes The Walking Dead meets whatever new IP they're playing with. At the end of the episode, everyone had abandoned Star Lord, except for Rocket. It seems very unlikely that any of them will reunite so I'm curious to see how Telltale are going to pull it off for the final episode. I've made no progress on Horizon Chase Turbo since I want to be reconnected to the NBN before I play it again (and unfortunately, that's probably not going to happen until the middle of next week earliest). I haven't made any further progress on this – it's now on hold while I am distracted by… well… a lot of other games :). Wow, I'm genuinely stuck on one of the missions in Door Kickers. The mission is set in a fire station and a whole bunch of hostages are surrounded by terrorists in the garage. As soon as you start shooting at them, all hell breaks loose and there's a high chance of hostages dying. So, I decided that maybe using Stealth operatives would work better but I unfortunately can't figure out how to have them firing in sync at multiple targets (and if it's even possible).